The best theoretical lap is used in both the calculation of the "Time Slip" and "Rate of Time Slip", as well as in the summary statistics. The best theoretical lap is calculated by taking the fastest "bits" of all the data currently loaded in to the program to get a single best possible lap that you could have driven. 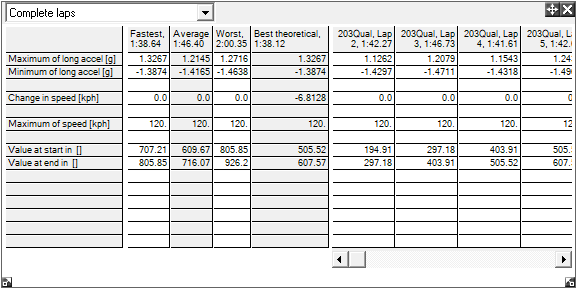 Note that whilst the "best theoretical lap" is used to calculate internal results, it is not possible to look at the data directly. However since the data is only an ensemble of parts of other runs, it is of course possible to look at the component parts if required. There are limitations of the "best theoretical lap" system, for example if you drive into a corner too fast you will be forced to take a poor line and your exit speed will be low. However the software may take the entry speed from one lap and the exit from the other resulting in a fast but technically impossible corner. Another limitation occurs with very closely spaced lap markers - the accuracy of the track maps is a few meters, so if you say added 50 lap markers to a short circuit you may find that you start to get unrealistically fast timings due to an accumulation of small errors in the data.